Naji Abu Nowar co-writes and directs this Arabic drama set during the First World War. Naji Abu Nowar co-writes and directs this Arabic drama set during the First World War. In the Ottoman province of Hejaz, young Bedouin orphans Theeb (Jacir Eid Al-Hwietat) and his older brother Hussein (Hussein Salameh Al-Sweilhiyeen) embark on a perilous journey across the desert to take an English soldier and his Arabian guide to a well near an Ottoman train track. Although Hussein orders his younger brother to stay home, Theeb follows and is soon left to fend for himself when the rest of the group are ambushed and killed by Arab rebels. When an injured mercenary comes across the youngster the pair are forced to rely on each other to survive in the inhospitable desert amidst the surrounding violence. In the Ottoman province of Hejaz, young Bedouin orphans Theeb (Jacir Eid Al-Hwietat) and his older brother Hussein (Hussein Salameh Al-Sweilhiyeen) embark on a perilous journey across the desert to take an English soldier and his Arabian guide to a well near an Ottoman train track. 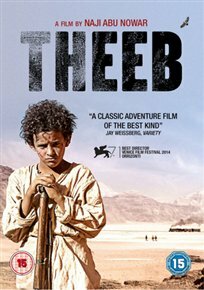 Although Hussein orders his younger brother to stay home, Theeb follows and is soon left to fend for himself when the rest of the group are ambushed and killed by Arab rebels. When an injured mercenary comes across the youngster the pair are forced to rely on each other to survive in the inhospitable desert amidst the surrounding violence.